When you’re designing your ideal kitchen, you want something totally unique and customized. Something that suits your needs, down to the last detail. Something that nobody else has. With a world of materials and our design experts, the possibilities really are unlimited. 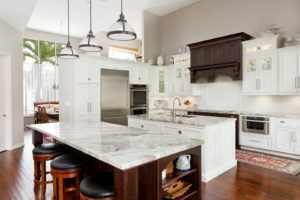 So here are 5 ideas for a truly innovative kitchen design. After all, fortune favors the bold! Give your kitchen a quaint, classic look with glass-fronted cabinets. You’ll be able to see what’s in store – and show off your elegant tableware. For a more stripped-back, space age look, try fronting your custom kitchen cabinets with mirrors. Take inspiration from traditional Japanese design, and install sliding kitchen cabinet doors. They’re exquisitely functional, and add a subtle note of style. Who said that cabinets have to be made of just one material? Try mixed-media designs with different woods, or choose gleaming steel cabinets with accents in other materials. If you’re a fan of organic, minimalist design, then this one’s for you. Streamline your kitchen cabinets by removing handles altogether. Replace them with cut-outs for you to grip, or install seamless press-to-open cabinet doors. Vintage and distressed materials are a hot trend for the year to come. Add some faded elegance to your kitchen design with distressed wood, weathered stone, or oxidized metal designs. Whatever you imagine for your new kitchen, we can turn your design into a reality. Speak to our experts at DKB Cabinetry to start bringing your dream to life.